The DJI LightBridge Air System Antenna Extension and Panel Antenna Holder allows you to mount your antennas in a different location on your airframe for better line of sight with the DJI LightBridge Ground System transmitter. This will allow you to gain maximum range from your system. 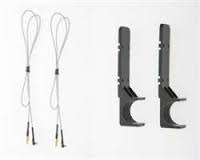 It is recommended to use the DJI Lightbridge Air System Antenna Panel Antenna with this product. Martin is very knowledgeable about anything to do with ANY Dji product. As a chinese speaker, I sometimes phoned or emailed shenzhen, China for products enquieries. I dont need to do it now since there is a dji expert in UK. Thank you for helping me to install my lightbridge.